Sindh Healthcare Commission (SHCC) Karachi Sindh. Sindh Health Care Commission (SHCC) has been established by Govt. 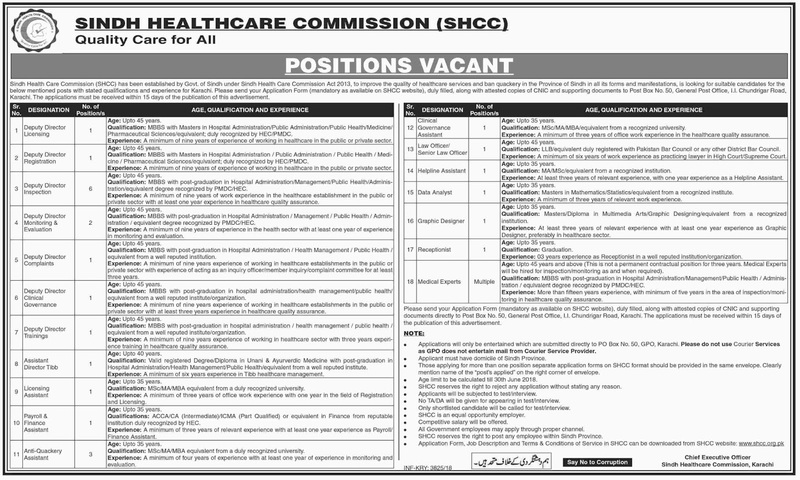 of Sindh under Sindh Health Care Commission Act 2013, to improve the quality of Healthcare services and ban quackery in the Province of Sindh in all its forms and manifestations, is looking for suitable candidates for the below mentioned posts with stated qualifications and experience for Karachi. Qualification: MBBS with Masters in Hospital Administration/Public Administration/Public Health/Medicine/ Pharmaceutical Sciences/equivalent; duly recognized by HEC/PMDC. Experience: A minimum of nine years of experience of working in healthcare in the public or private sector. Qualification: MBBS with Masters in Hospital Administration / Public Administration I Public Health / Medicine / Pharmaceutical Sciences/equivalent; duly recognized by HEC/PMDC. Experience: A minimum of nine years of experience of working in healthcare in the public or private sector. Qualification: MBBS with post-graduation in Hospital Administration/Management/Public Health/Administration/equivalent degree recognized by PMDC/HEC. Experience: A minimum of nine years of work experience in the healthcare establishment in the public or private sector with at least one year experience in healthcare quality assurance. Qualification: MBBS with post-graduation in Hospital Administration / Management / Public Health / Administration / equivalent degree recognized by PMDC/HEC. Experience: A minimum of nine years of experience in the health sector with at least one year of experience in monitoring and evaluation. Qualification: MBBS with post-graduation in Hospital Administration / Health Management / Public Health / equivalent from a well reputed institution. Experience: A minimum of nine years of experience of working in healthcare establishments in the public or private sector with experience of acting as an inquiry officer/member inquiry/complaint committee for at least three years. Qualification: MBBS with post-graduation in hospital administration/health management/public health/ equivalent from a well reputed institute/organization. Experience: A minimum of nine years of experience of working in healthcare establishments in the public or private sector with at least three years experience in healthcare quality assurance. Qualification: MBBS with post-graduation in hospital administration / health management / public health/equivalent from a well-reputed institute/organization. Experience: A minimum of nine years of experience of working in the healthcare sector with three years experience training in healthcare quality assurance. Qualification: Valid registered Degree/Diploma in Unani & Ayurvedic Medicine with post-graduation in Hospital Administration/Health Management/Public Health/equivalent from a well-reputed institute. Experience: A minimum of six years experience in Tibb healthcare management. Qualification: MSc/MA/MBA equivalent from a duly recognized university. Experience: A minimum of three years of office work experience with one year in the field of Registration and Licensing. Qualifications: ACCA/CA (Intermediate)/ICMA (Part Qualified) or equivalent in Finance from a reputable institution duly recognized by HEC. Experience: A minimum of three years of relevant experience with at least one year experience as Payroll/ Finance Assistant. Qualification: MSc/MA/MBA equivalent from a duly recognized university. Experience: A minimum of four years of experience with at least one year of experience in monitoring and evaluation. Qualification: MSc/MA/MBA/equivalent from a recognized university. Experience: A minimum of three years of office work experience in healthcare quality assurance. Qualification: LLB/equivalent duly registered with Pakistan Bar Council or any other District Bar Council. Experience: A minimum of six years of work experience as a practising lawyer in High Court/Supreme Court. Qualification: MA/MSc/equivalent from a recognized institution. Experience: At least three years of relevant experience, with one year experience as a Helpline Assistant. Qualification: Masters in Mathematics/Statistics/equivalent from a recognized institute. Experience: A minimum of three years of relevant work experience. Qualification: Masters/Diploma in Multimedia Arts/Graphic Designing/equivalent from a recognized institution. Experience: At least three years of relevant experience with at least one year of experience as a Graphic Designer, preferably in the healthcare sector. Qualification: Graduation. Experience: 03 years experience as Receptionist in a well-reputed institution/organization. Qualification: MBBS with post-graduation in Hospital Administration/Management/Public Health / Administration / equivalent degree recognized by PMDC/HEC. Experience: More than fifteen years of experience, with a minimum of five years in the area of inspection/monitoring in healthcare quality assurance. Please send your Application Form (mandatory as available on SHCC website), duly filled, along with attested copies of CNIC and supporting documents to Post Box No. 50, General Post Office, I.I. Chundrigar Road, Karachi. The applications must be received within 15 days of the publication of this advertisement. • Applications will only be entertained which are submitted directly to P.O Box No. 50, GPO, Karachi. Please do not use Courier Services as GPO does not entertain mall from Courier Service Provider. • Applicant must have domicile of Sindh Province. • Those applying for more than one position separate application forms on SHCC format should be provided in the same envelope. Clearly, mention the name of the "post's applied" on the right corner of the envelope. • Age limit to be calculated until 30th June 2018. • SHCC reserves the right to reject any application without stating any reason. • Applicants will be subjected to test/interview. • No TA/DA will be given for appearing in test/interview. • Only shortlisted candidate will be called for test/Interview. • SHCC is an equal opportunity employer. • The competitive salary will be offered. • All Government employees may apply through proper channel. • SHCC reserves the right to post any employee within Sindh Province.